Alpine Ocean Seismic Survey, a provider of marine surveying and data collection services, has launched a multi-use research vessel, the R/V Shearwater. With the addition of this new vessel, Alpine can now further expand its offerings of turnkey data collection and other surveying services to offshore clients, including wind, tidal, civil engineering, shoreline protection, submarine cable, pipeline, oil, and natural gas project developers. With offshore wind projects totalling 6800 MW in the works off the East Coast alone, experts say the demand for specialty vessels like the Shearwater will soar. "The Shearwater is a state-of-the-art, multipurpose platform with fantastic maneuverability, and that means it's suitable for both offshore and near-shore projects," says Robert Mecarini, executive vice president, Alpine Ocean Seismic Survey. "The flexibility means our customers can get a lot value for their money – we can deploy a variety of specialised equipment, collect data, and process it quickly right on board." The shallow draft (6.5ft) 110ft‚ x 40ft‚ aluminium twin hull Shearwater has numerous advantages for offshore work. Its superior positioning and line-keeping performance provides the essential components for both research work and transfer and supply services to development sites and working installations. The hydraulic propulsion system results in fuel-efficiency and excellent maneuverability while reducing vessel noise. The Shearwater also features two equipment moon pools, a crane, hydraulic stern A-frame, fixed starboard A-frame, dedicated equipment winches, laboratory and office space with onboard data processing capabilities, and can accommodate up to 20 people on a 24-hour basis. Since its March commissioning, the vessel has completed several projects on the Gulf and East Coasts for clients including the US Army Corps of Engineers and the NJ Department of Environmental Protection. Clients tout the vessel's configuration capabilities, spacious decks and workspaces, and a propulsion system that facilitates high-precision line- and station-keeping. * Hydraulic thruster propulsion with 360-degree rotation capacity. * Hydraulic crane with two-ton capacity at 38ft boom extension. * One-ton hydraulic stern A-frame. * Five-ton fixed starboard A-frame. * Equipment moon pools in port and starboard hulls. * Sleeping quarters for 20 people, including separate client quarters. In operation since 1957, Alpine has global experience delivering underwater services for offshore, and inland marine and freshwater projects. Now part of the Gardline Marine Sciences Group, a UK-based company with decades of expertise in marine services for renewable and other energy projects worldwide, Alpine is a key partner to companies with projects under development in the burgeoning US offshore renewable energy market. In addition to providing the professional services that leverage the vessel‚s superior marine capabilities for turnkey operations, Alpine leases the Shearwater and its crew to independent services providers. Alpine Ocean Seismic Survey provides marine surveying and data collection services, including geophysical, hydrographic, oceanographic, geotechnical, and positioning services, for offshore, coastal, and inland marine and freshwater projects. Fig. 1. 2. 3. 4. R/V Shearwater combines superior stability and maneuverability with state-of-the art research facilities to provide a flexible, multipurpose platform for marine surveying related to renewable energy, oil and gas, cable and pipeline, and civil engineering projects. Photos: Franky Stankiewicz, Alpine Ocean. Fig. 5. 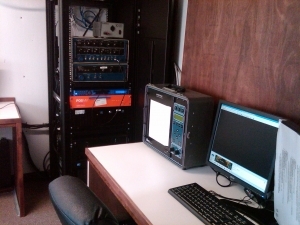 The R/V Shearwater has dedicated office space. Photo: Franky Stankiewicz, Alpine Ocean. Fig. 6. The 110ft research vessel also has dedicated laboratory space. Photo: Franky Stankiewicz, Alpine Ocean.